Ok so the loom is working again. The 4 scarves above have been woven over the last week or so. I have put a new warp on the loom and have one finished scarf and part of another one woven and they are still on the on the loom. Thought you might like to see the progress Mel. Tying painted wool warp on loom. Mel sent through some photos for the weaving on the loom so thought I would post start, middle and finished weaving! In issue 33 of Selvedge Magazine they announced a writing competition. I am sure there was a previous one and will find it Mel. This particular competition was called Word Perfect. Can you capture the essence of a textile-related destination without resorting to cliches? In 800 words and to be written in the 3rd person. I will scan the text and we can use it as the starting point. Mel visited for the weekend and we had a fantastic time. Hopefully we have solved the loom delemer. We think it is missing a spring for tensioning but it has never been on the loom and just good luck has held it tight enough for it to work. Now I have to find a ring to attach to the wooden part for the spring and it needs to be more square shaped and will also need something to protect the wood. So back to the Auto shop and how nice was it to walk in to Autobarn and have the nice young gentleman know exactly what sort of spring we would be requiring. Mel sent me this image and link. I think it would make for some fantastic weaving but just what and how ? Thoughts Melly? The dress is divine and I would love to wear something like it just imagine the movement. And being the shoeaholic that I am look Melly must haves oh and coloured shoes. 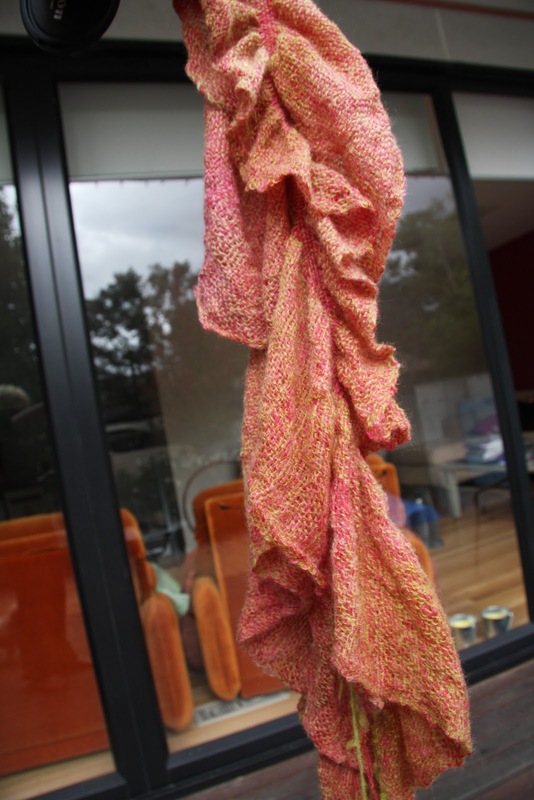 I finished this scarf on the little tokia, its an old warp that I over dyed green and pink and the wove with wool and silk weft. I pulled some threads and felted it so a 210 cm weaving is now just under 100cms. I still have enough warp I think to do another scarf so may try a bit of blue in the weft. Still a bit wet when I took these photos! thank you for visiting Mel, so much fun and can't wait for our next playtime in the studio. now back to the grant writing. I have loooved getting back to some production weaving! Who'd have thought?? And Sturt gardens have been so beautiful! And I bought this cute necklace/brooch made from wood and old kimono fabric - I can't remember who made it - I will find out and repost. Feel so much better this week! Today I used up the last of a navy wool warp. It was 10inchs wide and approx 15 threads per inch. 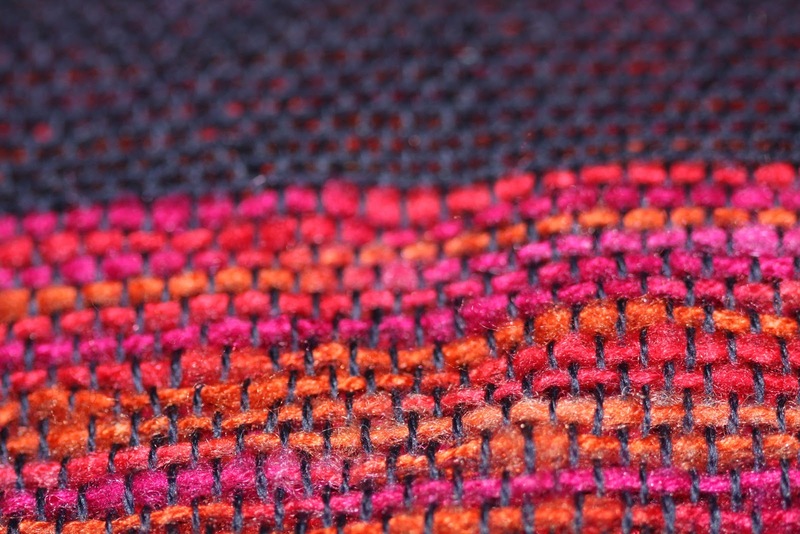 I used a weft of mixed pink/orange mohair and navy wool with lycra. I have not finished it yet and it need the fringe and need to wash it. It ended up being just 155cm long as with fringed. I thought there was more left on the warp. 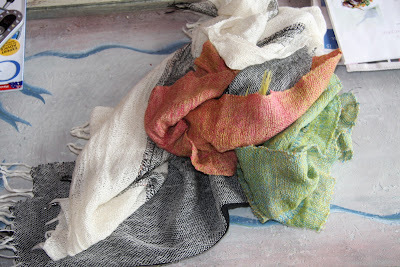 Will put up a photo after I have washed the weaving. So I need to put a warp on and I hate getting under it to retire up. My back is so bad and when I get under I am in so much pain I hate it. So any ideas as what I could do with whats on there ? May be some collapse weave? I need to wind a warp and do something if I don't weave some thing i don't think I will ever weave again just waiting for the fairies to fix my loom. So I've had a very wacky week. To winge a little, I've just finished working 17 days straight with between 3 and 6 hours sleep at nights. I'm a little twitchy. The important up side to this though is that I've been craving my weaving massively. So I finally finished threading up that warp from when you were up here Belly. 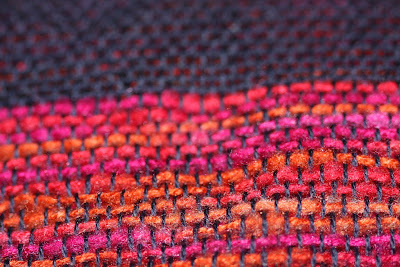 And on Tuesday I finally put on that mock pile warp on - I loved it! And want to play more with it! But I was so happy today when I was finally able to start weaving the scarves. 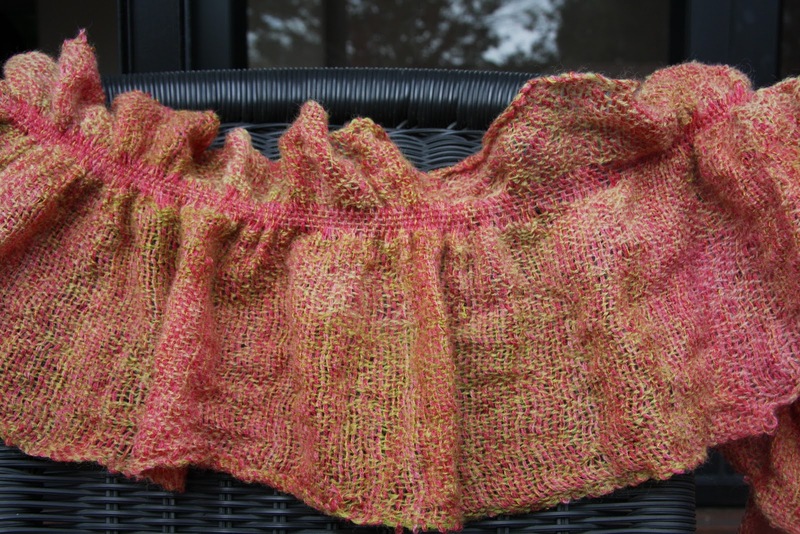 It had a few issues like a couple of broken threads (caused by laziness of winding overtwisted wool with rayon - I thought of it as I was winding it but, well, I was lazy). I still loved doing it though.